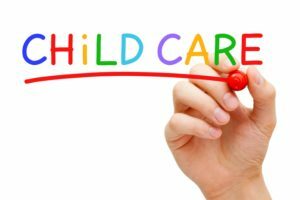 Approximately 23.4% of children under the age of five are enrolled in some form of child care arrangement, including having a nanny or being in daycare. What many parents don’t know is that enrolling a child in daycare has more benefits than leaving them with a babysitter. If you’re wondering what some of these benefits might be, here’s a short list of ways in which child care centers can benefit your children. Those children who spend the majority of their time with their mothers or a sole caregiver are more likely to experience emotional issues such as general anxiety and separation anxiety. Being exposed to other children and multiple caregivers can help alleviate this experience both in the present and in the future. A child’s first day of school is always tough, but if your child has been socialized well since the time that they were a baby, then that first day will be easier on both of you. Not only will separation anxiety not pose an issue, but your child will have an easier time adjusting to the classroom and making friends once they feel comfortable in that setting. 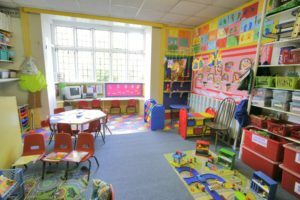 Day care centers are held to certain standards by the government, which means that they will be held accountable for anything and everything that happens while your child is at their facility. If you hire a babysitter or a nanny, there’s no real accountability unless you have surveillance set up in your home to ensure that they’re performing their duties properly. Leaving someone alone in your home with your child can be a huge stress factor for you as a parent. 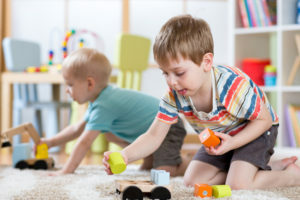 Meanwhile, day care facilities will allow you to sit in on their practice with your child so you have complete confidence that they will provide the best child care services available to you. It’s completely normal to be nervous about leaving your child in anyone’s care besides your own, but don’t cross day care off of your list just for that reason. Today, less than one-third of children have a full-time, stay-at-home parent. In 1975, more than half of all children had a stay-at-home parent looking after them. More people are working full-time now, which is good, but it’s now more important than ever to make every moment with your kids count. Use the time you are able to be with them as teaching moments. Current child care practices vary and depend on both the parent and the children. Some people believe that keeping kids in the school mindset when they get home strengthens their cognitive abilities, while others believe that it’s better to let children have free time at home to relax and clear their minds. The most effective current child care practices utilize a combination of both. You can’t expect your kids to focus on school, learning, quizzes, reading, homework, and curriculum at all hours in the day — it’s impossible. Although you do have to let them be kids, don’t let them make your home a free for all as soon as they get home from school. It’s a balance and can often be difficult to achieve, but if you do, your kids will certainly benefit and grow into great people with a real shot at success. Allow your child to deconstruct a little bit when they first get home. Give them a nice snack and talk to them about their day. Plan out what works best for you and your family, whether it’s doing some more schoolwork before dinner, or waiting until after dinner to get the work done. The best way to balance the educational and playing balance is to do both at the same time. Rather than just doing lessons with your kids, play little games as a family that will build their cognitive skills. These games, if done correctly, can both be rewarding on an educational level and improve your relationship as a family. To learn more about the most effective current child care practices, contact Growing Room Child Development Centers today! Raising a child will simultaneously be the most amazing thing you’ve ever done and the most difficult. There is no one correct way to successfully raise your kids, but there are plenty of wrong ways. A common misconception among parents is that to be effective parents, they need to be with their children all the time and give them whatever they need. This just isn’t true, and it’s far better, for both the parents and the child, to have some separation at some point. Healthy separation allows the child to grow and mature. 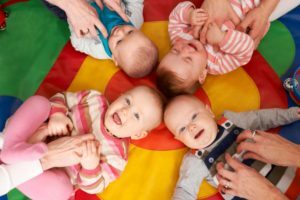 Daycare and after school child care programs are a great way for parents to take a break from the stresses of parenthood and allow the child to grow in a new environment (and make some new friends along the way). Here are two reasons why you should think about daycare programs for your young child. Just because you know more than your child doesn’t mean you know how to properly pass that knowledge onto them. Early education is so essential for a child’s development because during the first few years of their life, roughly 700 new neural connections are formed every second. Because of this, you should leave the majority of the early education to the professionals. Your kids will practice active learning techniques and will be on the right track for a successful future as they progress through the education ranks. Another benefit of daycare centers is that there are more adults present that are not related to your child. If you and your spouse are the only adults regularly around your child, it’ll be difficult for them to understand the importance of respect for grown ups. Obviously, you don’t want your children to have the same kind of relationship with other people as they do with you, so it’s important that other adults have a role in their lives at an early age. The professionals working at these facilities will be able to teach your child to listen and respect to non-parent authority figures. If you want to set your kid up for a successful childhood and beyond, contact Growing Room Child Development Centers today to learn more about toddler education and development. When a young child does something wrong, they usually aren’t deliberately misbehaving. They don’t squirt ketchup all over the dog just so you’ll have a mess to clean up; they do it because they want to see if it will turn a white dog red, or because it’s like finger-painting, or because — well, who knows. Asking a child for a reason behind this kind of action can be an exercise in futility. Other times, they have their own, vey important reasoning for their behavior, which just doesn’t take into account the bigger picture. They ran into the street to get their bouncy ball, without realizing the dangers of traffic. When they misbehave, remember that they don’t have the same experience or reasoning capacity that an older child does; explain why their behavior wasn’t acceptable, but be gentle and don’t punish them. As parents, we want to see our children succeed. That’s natural, but it’s important to realize that the children aren’t really succeeding unless they do so themselves. It can be hard to hold back, but let your child experience small challenges and even failures. If you see him struggling to finish a puzzle, read a page from his favorite book, or put his shoes on the right feet — don’t just swoop in and do it for him. That might help in the short-term, but won’t build their skills or their confidence for the long-term. Provide help when they ask, or if the task at hand is beyond their skill level, but let your child struggle from time to time. Learning to rely on other people to finish troublesome activities isn’t good for adults. Whether you’re in a happy and healthy marriage or recovering from a nasty divorce, you should never bad-mouth your child’s mother or father in front of them. Children are extremely impressionable at a young age. The period from birth to three years old is the fastest rate of brain development during the entire life span — so don’t fill their brains with negative talk about others. Especially when this talk concerns someone they love and trust, such complaints can cause a child confusion and stress that can cause serious problems down the line. If you want to help turn your toddlers into great little humans who are ready to take on the world, contact Growing Room Child Development Centers today!